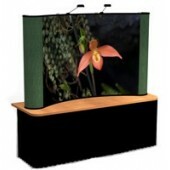 Nothing will be quite as visually stunning at the next trade show or expo you attend, as the curved backdrop displays that you find. 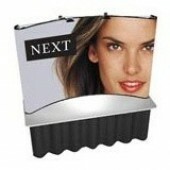 These unique displays will capture the attention of people from across the room and boost the amount of traffic your booth will receive. 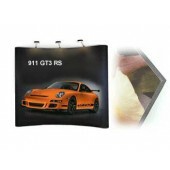 At Numart Display, we have the ability to not only print your brand name and logo on the curved backdrop displays you order, we can also insert product images and designs that you would like to showcase in your booth. This can add a more personalized feeling with the customers you interact with and that can help you to generate more business, thanks to this advanced advertising tool. 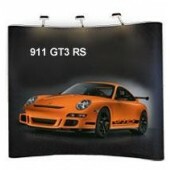 The exterior is created with high resolution panels that have been covered with the artwork you have selected. They are then laminated to ensure there is a professional finish and shine that will help them to pop out when people pass them by and see your images. You will find that that these backdrops can be a simple 4' x 4' design, that is a complimentary piece to your layout, or an incredible 4'x 10' display that commands attention and really draws people into your booth. It is important that when you do choose these backgrounds, to verify that the event you are attending will allow the size you plan on to display. Some events have size restrictions and it will be important that you adhere to them, or you may be asked to take your display down. 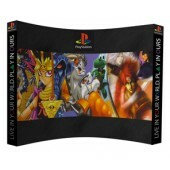 These curved style backdrops are easy to setup and come with the essentials to ensure that they are showcased properly. 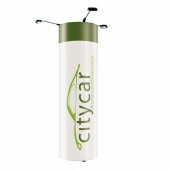 They include a sturdy rolling case for easy transport, spotlight for better showcasing and magnetic strips to ensure that they look professional as they securely attach to their frame. In some cases, it may be useful to have several different options you can pull out to showcase different sides of the company. You can have a back drop that showcases your company as a great place to seek employment at, design one to showcase the company in a professional setting and even have ones that highlight the image of the company and some of the featured areas you want customers to focus on. What you will find is that among the options you have for advertising at trade shows, this will remain one of the best choices available. 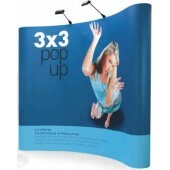 With high resolution artwork and quality craftsmanship, you will be able to continue to count on this tool to help you to drum up new business and to stand out in a sea of tables, when properly setup behind you, while you attend any trade show or expo.